By this very definition, it’s somewhat easy to observe the difference between the idea of content marketing and advertising. Instead of pitching your products and services directly to your target audience, as you would with a traditional advertising campaign, with a content marketing strategy you will be providing useful and relevant content to your customers and prospects as a means of anticipating and solving their problems. In exchange for this service, your audience will begin turning to you for regular input, thus branding you as an authority figure in the industry. Depending on the efficiency of your content marketing strategy and the value provided by the content, itself, you will be able to reverse the relationship between your company and customers. So, instead of pushing your product through various channels of communication and hope that some of it will stick, with content marketing you indirectly create awareness about your product by helping your customers and prospects with channels such as blogs, social media, etc. Content marketing came to prominence right alongside the internet. If in the past it made complete sense to use ads to promote products and services, be it via TV, radio, newspapers, magazines, or direct mail, with the arrival and spread of the internet, the proliferation of ads has led to some unforeseen circumstances. There are several reasons why content marketing is more efficient than the alternative – one of the most important being ad fatigue. In short, Ad fatigue is a condition by which consumers grow increasingly tired of being constantly bombarded by repetitive and interruptive ads. In this scenario, people who suffer from ad fatigue may not even realize it. And while this condition does not necessarily affect them directly, the one who truly stands to lose from this situation is the advertiser. As it so happens, Ad fatigue may lead to an unconscious feeling of resentment toward the brands in question, resulting in decreasing brand reputation, ad performance, and campaign ROI. All numbers indicate that content marketing is gaining more traction than ever before. Major brands such as Cisco, Virgin Mobile, Toshiba, Marriot, American Express, IBM, Intel, LinkedIn, Coca-Cola, and even Lana Del Rey, among many others, all made it big by using content marketing. But while not all of them are B2Bs, the efficiency of this particular marketing strategy cannot be contested. Concerning B2Bs, statistics show that 89% of all such companies are using content marketing. Among these, 73% consider turning content marketing as their de facto marketing strategy, going forward. What’s more; 63% of all B2B marketers are very committed to their content marketing, while 70% are looking to create even more content than they created the year prior. One reason for this could be that content marketing is evolving and becoming more efficient, as a result. 70% of B2Bs that use it say that it’s much more effective than it was last year. In addition, content marketing gets three times more leads than paid search advertising. B2B companies that blogged more than 11 times per month had seen three times more traffic than those who blogged 0-1 times per month. Likewise, companies that published 16+ blog posts per month witnessed 3.5 times more traffic and 4.5 more leads than those that published a maximum of 4 posts per month. An important aspect that defines advertising is the fact that it’s interruptive. Regardless of the channel used – TV, radio, print, social media, etc. – an ad works by interrupting you from whatever activity you were doing and, more or less, force you to watch it. Over the internet, all sorts of advertisements are littering websites of all shapes and sizes. As a direct consequence, more and more internet users are turning to ad-blocking software as a means of sparing themselves from ad fatigue. In fact, over 20% of all internet users between the ages of 16 and 34 are using some adblocking software. In 2016 alone, the total cost as a result of adblocking was over $40 billion. A lack of interruptive ads is also one of the primary reasons why 36% of US households are subscribed to Netflix, as opposed to Hulu, for example. And given these facts presented here, it’s no wonder that advertising campaigns are becoming less worthwhile. In addition to all that’s been presented above, there are other benefits of content marketing in comparison to traditional advertising. Unlike advertisements, content has the advantage of engaging the customer, instead of interrupting them from whatever they were doing, in the first place. Not only does this put you in a better light, but it also gives you the opportunity to develop your brand’s reputation and to generate qualified leads. You can also use this content to set yourself apart from the competition by providing your audience with valuable information which they can use to better their personal and professional life. Google points to how-to videos and similar material as an essential marketing asset. In their research, it turns out that over 65% of millennials often turn to this type of content as a means of quickly picking up a new skill, or learning how to use a particular product. You can also use content marketing to promote success stories. Testimonials are a particularly good example of this as they offer the necessary reassurance to people before considering employing your services. There is no secret that happy customers tend to provide the most business to a company. Nevertheless, studies have shown that between 60-80% of customers who describe themselves as satisfied with a company’s services, will NOT do business with that company again. A lack of connection is to blame here. But with a proper content marketing strategy at play, this connection can be maintained long after the first purchase took place. Google’s updated search algorithm for ranking websites now puts a much stronger emphasis on quality content than it did in the past. By providing high-value content on a consistent basis, you will not only increase your reputation and draw more leads but also improve your website’s standing in Google’s search results. 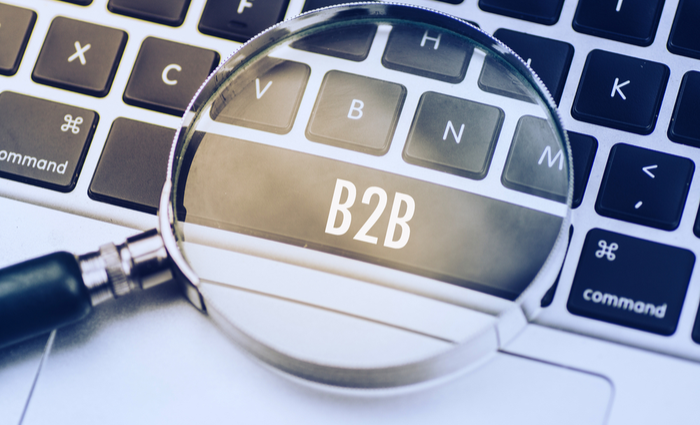 While the list of benefits presented here is by no means exhaustive, it, nevertheless, shows just how much potential content marketing has for a B2B company. Unlike typical adverts, content marketing is more effective and more meaningful to your clients. It helps you maintain lasting relationships with existing customers as well as to build new ones. In short, people relate much better to quality content than interruptive advertisements. If you want to learn more; get a free digital consultation from a professional Content Monsta!